(CNN) -- World No. 1 Rafael Nadal easily dismissed Andy Murray in straight sets on Sunday to claim the first ATP World Tour Masters tournament of the year in Indian Wells, California. 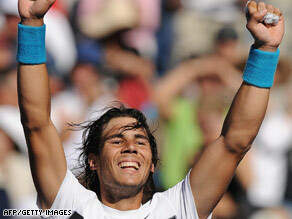 Rafael Nadal easily defeated Andy Murray in Masters final in California. Winning the final five games of both sets, the 22-year-old Spaniard crushed Murray 6-1 6-2 to win the event for the second time in three years. The match lasted just one hour, 20 minutes and was played amid persistent high winds. "The conditions today were really difficult, but I think I have good strategy and I played a really good match with those conditions," Nadal said after the match, in remarks posted on the ATP Web site. The victory gives Nadal 13 ATP World Tour Masters titles, just one behind Federer and four behind all-time leader Andre Agassi. The final marked Murray's most lopsided loss since he fell to Marcos Baghdatis by the same score in August 2007 and his first defeat by a top 10 player this year. Murray, who had beaten Roger Federer in the semifinals and had won his two previous matches against Nadal, admitted that the conditions had affected his performance. "I don't feel like I'm that disappointed just now with how the week went, because I wasn't expecting to do that well," the 21-year-old said. "Obviously today was not my best day, but I'll definitely get over it, because I'm guessing I'm not going to play in those conditions each week." Earlier Vera Zvonareva took her second singles title of the year as she defeated defending champion Ana Ivanovic 7-6 6-2 -- the Russian not dropping a set all tournament as she enjoyed her biggest career success to date. It is also her second trophy in as many days after picking up the doubles crown on Saturday. Zvonareva took the opening set 7-5 on the tie-break against her Serbian rival -- she made 44 unforced errors in the match -- and took the title on her second championship point.